NEW! 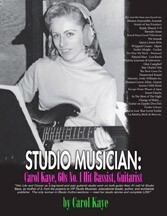 "STUDIO MUSICIAN: CAROLKAYE, 60s #1 Bassist, Guitarist"
Her long-awaited 503 page full-sized 8-1/2 x 11 Autobiography book with 53 photos is endorsed by fine famous, James Gavin, Chuck Granata, Steve Todoroff, and also by Earl Palmer's daughter Shelly Palmer. Will sign upon request. Her life and professional musician/educator start, playing jazz guitar gigs - big-band touring 1954-55, bebop jazz in late 1950s L.A., Hollywood Studio Work hits on guitar 1957, No. 1 call bass inventing lines 1963 into 1970s on records, movie scores, and TV-show films, working with other Top Pro's, stories about the hits, the stars of the Music Recording World into the 1950s-60s-1970s and beyond. Her complete LOG of work-calls, her awarded Gwyn Publishing Inc. business - her famous books/courses teaching bass players worldwide her invented music lines. Also has the business deals, and later comeback in Studio work, writing and playing more live Jazz! Insider stories, 53 photos. Only $31.00 USA, + Media or Priority Mail. Payment choices are PayPal or Mail-In - Carol Kaye, PO Box 1183, Rosamond, CA 93560. 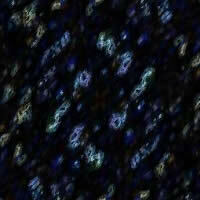 1st Class Air Mail prices to Canada, and International listed on Menu - we ship immediately.